Growing up this was one of our favorite tortes, I always wished for fall to hurry and get here because I knew grandma was going to make her favorite cake every year without fail when those apples were ready. A scratch cake made with love that you'll never tire of. The taste is like a shortcake with an amazing glazed apple flavor. Great with coffee, this isn't real sweet. Serve with whipped cream or vanilla ice cream or plain. Combine honey and lemon juice in a large nonstick skillet; bring to a simmer over medium heat. Add apples, cook 10 minutes or until almost tender, stirring frequently. Remove from heat, set aside. Beat 3/4 cup granulated sugar, butter, brown sugar, and vanilla at medium speed of a mixer until well-blended (about 4 minutes). Add the eggs, 1 at a time, beating well after each addition. Stir in milk and lemon rind. Lightly spoon flour into a dry measuring cup, and level with a knife. Combine the flour, baking powder, and salt, stirring well with a whisk. Gradually add flour mixture to sugar mixture, beating at low speed until blended. Batter is very thick. Spread batter into a 9-inch springform pan coated with cooking spray pat down with floured fingers. Remove apples from skillet with a slotted spoon. Discard remaining any liquid left. Arrange apple slices in a flowered pattern on top or spokelike wheek on top of batter, pressing slices gently into batter, anything leftover can be put in the center of the torte. Combine 1 tablespoon granulated sugar and cinnamon; sprinkle evenly over apples. Bake at 350 degrees for 40 to 50 minutes or until cake springs back when touched lightly in center, be careful not to over bake. Cool in pan on a wire rack. Cut into wedges using a serrated knife. Serve with whipped cream or vanilla ice cream. Grandma was one smart woman using honey as a natural sweetener. How wonderful to have the recipe in the family. This is a great recipe, I love those that are handed down from generations past. You are paying it forward for your family now. Incredible!! i have done a cakes with apple yesterday. Your grandma is very great women and a beautiful cook. Claudia, I think your grandma's one looks bigger! haha... I bet yours one as luscious. Have a happy weekend. This has to be one of my favorite things that you've made. Claudia, I love the flavors and love that it was your grandmother's. This is the sweetest torte! 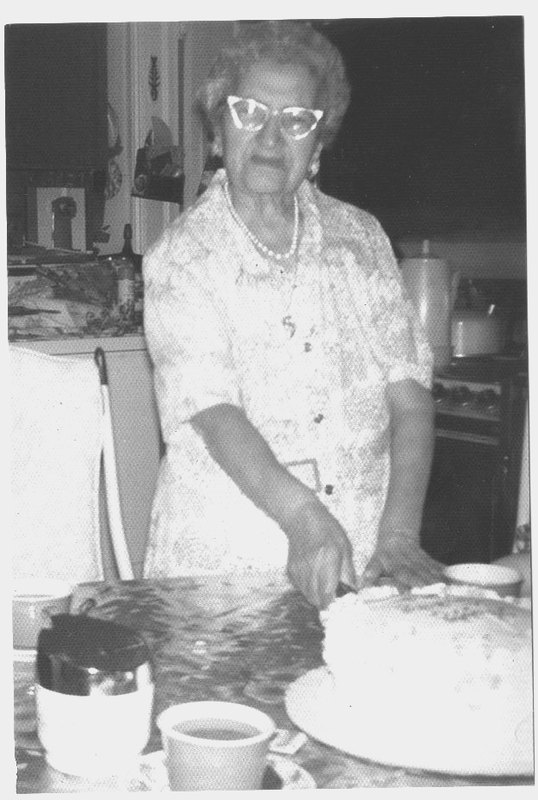 My grandmother also loved cooking with honey - I imagine it is what she was used to in Italy. The aroma in your kitchen must have been grand! Grandma's recipes are just the best! This is a lovely apple cake! Hi Claudia, This is one fabulous apple dessert. Wish I had all of my grandmas recipes. Wish we lived closer, I would love a slice of this right about now! i love this recipe ,it's great! Surface is wonderful, I copy and paste the recipe, I hope to try it soon, thanks for sharing! I too loved my grandmas recipes. This apple torte looks delicious. Thanks for sharing!!! What a lovely torte. I'm sure grandma was an incredible woman, and I bet the house smelled heavenly while the aplle honey torte was baking. Beautiful Claudia! Your grandma must have been a lot like mine...could take anything and turn it into something fabulous. This is lovely. I love using honey in cakes too...and yet, not once did I put it into an apple cake. Thanks for sharing this very comforting cake. I have not tried much of baking apart from cakes..any food that brings back memories undoubtedly is the best.